The Home Care Coding Specialist – Hospice (HCS-H) ICD-10 Certification Study Guide, 2019 will help prepare you to take the Home Care Coding Specialist-Hospice (HCS-H) ICD-10-CM certification examination, offered by the Board of Medical Specialty Coding & Compliance (BMSC). 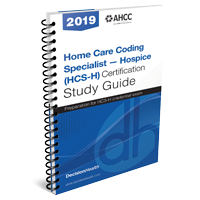 The Home Care Coding Specialist – Hospice (HCS-H) ICD-10 Certification Study Guide, 2019 will help prepare you to take the Home Care Coding Specialist-Hospice (HCS-H) ICD-10-CM certification examination, offered by the Board of Medical Specialty Coding & Compliance (BMSC), the credentialing arm of the Association of Homecare Coding & Compliance (AHCC). You’ll get tips and sample test questions to help you prepare for the exam. 20+ practice questions – Test yourself by applying what you’ve learned. 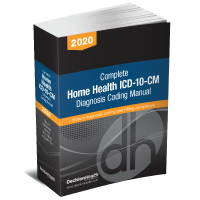 30-Day Money-Back Guarantee: If the Home Care Coding Specialist – Hospice (HCS-H) Certification Study Guide, 2019 doesn’t provide the information you need to help you prepare for the HCS-H ICD-10 certification exam, return it within 30 days of receipt for a complete refund of the purchase price. No questions asked.